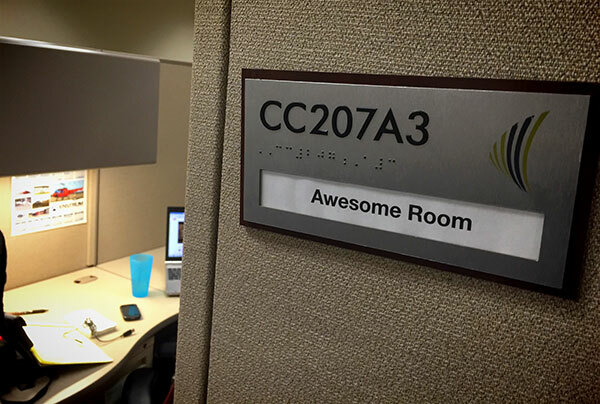 Does Your Workplace Have an Awesome Room? There is an Awesome Room in the offices of the Corporate Training & Economic Development department at Northeast Wisconsin Technical College. It’s more of a cubicle than a room, but still. It was the first time I ever thought happy things about a cubicle. It was created as part of a renovation that took place last year. Dean Stewart, the dean of the department, wanted to get everyone involved in the process. And so the team was empowered to come up with names for some of the extra common areas and conference rooms around the office. And so Awesome Room was born. I spoke at a Business Success Summit at the college last week, and evidence of fun and collaboration is everywhere. 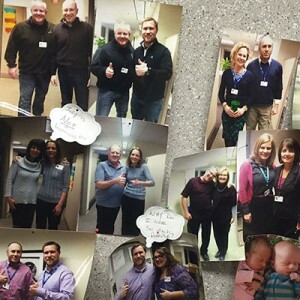 There is the Twins Board, a humble bulletin board that contains photos of people who inadvertently came to work to wearing something similar to a co-worker. 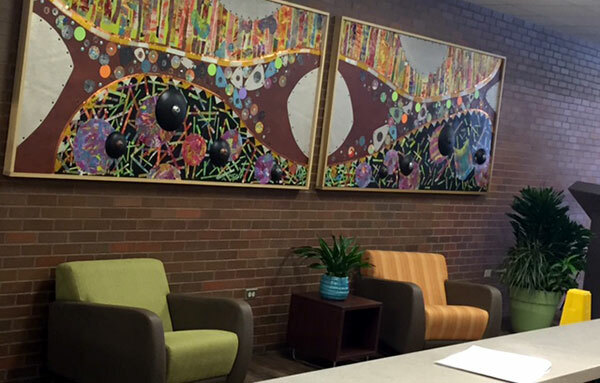 And the lobby is adored with art that was created by the entire team, with assistance of the nearby Artisan Center. The bright, welcoming collages even contain tiny black and white photos of the eyes, noses, and mouths of the individuals who participated. It was clear to me that Dean was a true Champion of Childhood. What was also clear was the sense of loyalty, community, and fun that was shared amongst the staff. We chatted a bit about how too many leaders assume that interjecting a little fun into the workplace is liable to threaten productivity and reduce standards. Dean was adamant that a sense of fun actually improves productivity, and he’s 100% right. We don’t need to replace elevators with slides or install foosball tables into our offices to instill a sense of fun into the workplace. (Not that I’m opposed to such measures.) The reality is that even tiny things can go a long way. Oftentimes it starts at the top, with wise leaders like Dean who get that taking your work seriously and taking yourself seriously are two completely different things. But Adultitis also fears the things that bubble up from the bottom of an organization, too, because those things can be just as effective and powerfully viral. A first step might be deciding where exactly your Awesome Room is located. Do you have any fun nooks and crannies where you work?